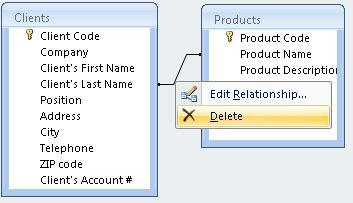 Access considers that 2 tables are "Combined" through a specific field when there is a relationship between them. This is easy to recognize by just looking at it. these 2 tables are combined because they are joined by a line. When we run a Query with 2 combined Tables, it will only show the Records which have equal fields through which the combination is performed. Thus, it is important to know how to create or eliminate combinations in Queries. 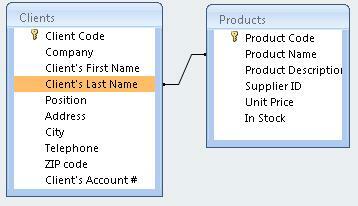 If the Tables selected for a Query are related to one another, they are automatically combined. however, if they are not related, we can also combine them in the manner that we know: by dragging a field to another field. Here, we have combined the 2 tables through the "Product Name" and the "Client's Last Name" fields. This can be helpful in case we want to offer our Client Products with his/her Last Name, for example . From this point on, it function is the same as if it were a Relationship between 2 tables. The only exception is that this combination is only functional in the Query in which we have defined it. No other Query will be affected by this combination. To eliminated this combination, we need to place the cursor over the line that joins both Tables and click on the right button on the mouse. This will open up a menu. Choose the option "Delete". Don't forget that if apart from this combination there is a relationship between both Tables, the relationship will still exist even if we have eliminated the combination. 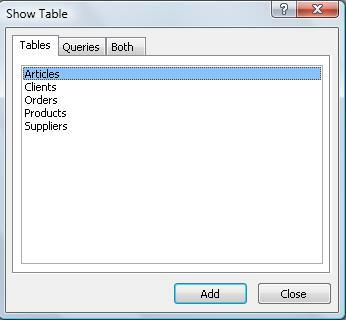 We can add tables to the Query to establish new combinations easily. We just need to click on the icon "Show Table". Now, we only need to add the tables we will use. 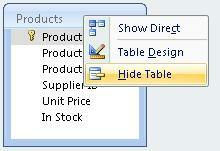 Eliminating a Table we won't be using in a Query is even simpler, just click on the right button on your mouse on the table you want to remove and select the option "Hide Table".